The KiLGA’s Executive Board had a meeting with ATHKL’s top officials at the company’s office in Bairiki on 25th November, that focused on telecommunication services by the company on the outer islands. The ATHKL team, led by the CEO, Mr. Kamleshwar Sharma, reported that his company has been given approval by government to upgrade telephone and internet services on Abaiang, Marakei, North Tarawa, Onotoa and Maiana. Plans for the remaining islands are awaiting a study carried by the Ministry of Communication, Transport and Tourism Development, funded by the World Bank, that will determine the work required to establish or upgrade the services there. Following the completion of the study, government will invite bids to undertake the work. Murray Staite and his wife, pictured, of MicroBusiness Services Ltd from NZ, were contracted by the Local Government Association of New Zealand (LGNZ) to assist the Betio Town Council improve its financial system and revenue generation. The KiLGA’s Executive Officer was invited to become a member of the KWinS (short for ‘Kiribati WASH in Schools’) Coordinating Committee. ‘WASH’ stands ‘Water, Sanitation and Hygiene’. The WASH programme is funded by New Zealand and jointly-coordinated by the Ministry of Education and UNICEF. 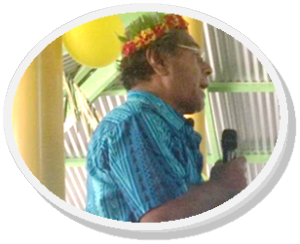 3 October, Tebungiroro village, TUC – Mayor Nakareke Benson, (pictured), spoke on behalf of his people, in thanking guests during the opening ceremony of the island mwaneaba, the “Bouateaina” built on a reclaimed area at the ‘Ananau Causeway’, now renamed ‘Tebongiroro’. The mwaneaba was blessed y Bishop Paul Mea, and opened by the Taiwan Ambassador, H.E. Donald Lee, witnessed by hundreds of invited guests and members of the Butaritari community on Tarawa. The government was represented by several Cabinet Ministers, led by Hon. Maere Tekanene, Minister of Education. Members of Tengaruru KUC and Nikunau island, two communities that provided support to people from Butaritari, also attended. 3 October, Bairiki—The Taiwan Ambassador, H.E. Donald Lee, hosted his country’s National Day celebrations at his Embassy grounds, attended by guests from government, partners, churches, communities as well as KiLGA officials. The chief guest, Beretitenti Anote Tong, in his last speech to the occasion as Head of State, said that the warm and mutually-beneficial relations between the two countries began in his first year in office and has grown from strength to strength. He is a strong supporter of Taiwan and told of his address in the recent UN General Meeting, when, despite calls by the chair to end his address, he managed to inform the Assembly of his support for Taiwan. The function was packed with invited guests and entertainers such as Te Wa Mai Kiribati dancing group and the newly acclaimed Flying Air Kick, a group of young modern dancers, who performed their spirited items in the rain. Members of the Flying Air Kick modern dancers from Ambo, who performed during the Taiwan celebration and also in the new Butairtari mwaneaba, the ‘Bouateaina’. 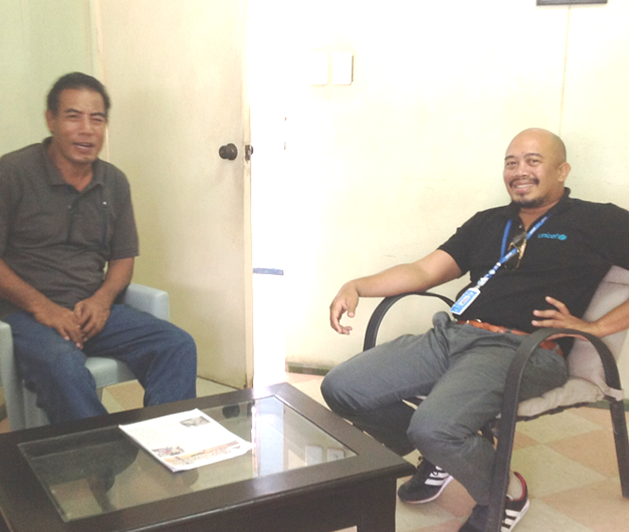 The Head of the UN Joint Presence Office and UNICEF’s Chief of Field Staff, Mr. Cromwell Bacareza, (pictured on the right) has agreed to KiLGA’s proposal to develop a partnership between the two organisations for the implementation and monitoring of relevant UNICEF’s projects in Kiribati. The partnership will, initially, involve a capacity building programmes for solar and water technicians from Councils.